From the rare Australian cover at the Museum of Adventure Game History. 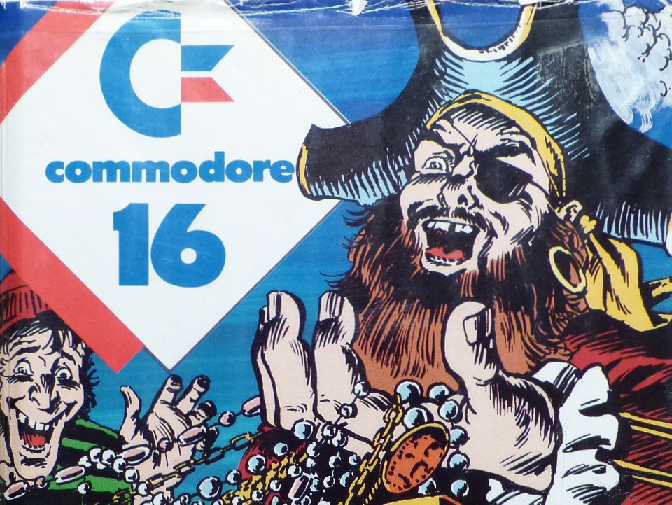 Given there’s only one pirate in the game, it seems to imply you’re the one on the left. So “Beginnner” as a difficulty was right. Perhaps “confusing plot-wise” might also be apropos. The pirate I mentioned in my last post is indeed the missing crew-mate. You find him sleeping in your flat. Perhaps he’s the same teleporting one from Adventure? In any case, I’m not sure why he’s all happy at helping you. I almost suspect there was some missing conversation from before the adventure started, but why would he be grouchy at taking your treasure chest then? So having the pirate on board allows you to sail to Treasure Island. 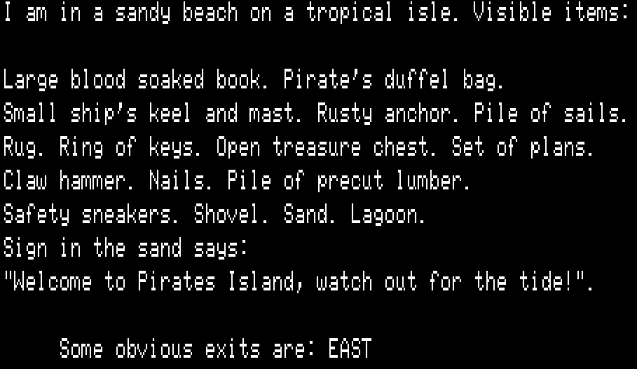 Following the map conviently obtained from the pirate’s treasure chest you can dig up a box with a shovel. The box has … rare stamps? Not what I’d associate with pirate treasure, exactly. The snakes will kill you if you try to take the treasure. However, the helpful mongoose from earlier … is apparently not a mongoose, and if you try to use it, you will end up with a “dead squirrel”. The parrot, on the other hand, will chase the snakes away, again just like in Adventure. I liked the parrot so much that I took it home with me in triumph. You may plausibly ask, what happened to the pirate? Well, he got drunk again, then after I woke him we sailed back to Pirate Island and I went home and got the screen above. He didn’t seem to care about the treasure. I guess for him, rum was the real treasure. I made something for the limit-yourself-to-300-words Twiny Jam. I didn’t think I could do much else in 300 words. The only real obstacle I made it through since last time was getting by the crocodiles, but that let me make a boat. The clever bit was the lagoon; the tide goes in and out. A fish out farther in the ocean gets away if you bring it back when tide is low. If you wait for the tide to be higher (so the fish stays in water longer) you can bring it to the crocodiles and feed them, who let you pass (and access all the supplies mentioned above). The dynamic aspect helped add to the feel of the environment; too much IF (even modern works) has static terrain. The only possible “crew” I’ve seen in the game so far is a pirate I immediately bribed away with a bottle of rum; he disappeared and I stole his treasure chest and parrot. Somehow I don’t think he’d be happy to join. I’ve found a mongoose that has been no use so far, and apparently mongooses also do not count as ship crewmates. 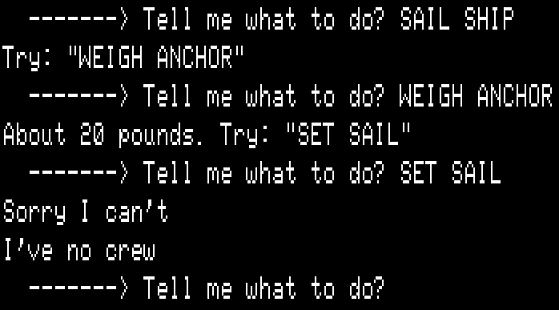 The parrot chatters quite a bit and eats crackers but remains unable to hoist the mainsail. Picture from the Museum of Computer Adventure Game History. 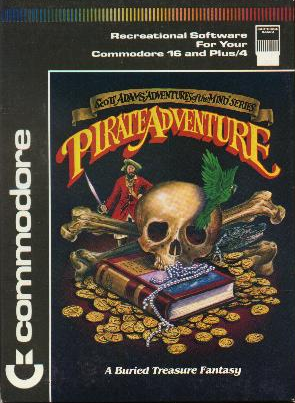 Out of all the Scott Adams games, Pirate Adventure is the only one with a difficulty level of “Beginner”. Does the designation hold up? Heavy puzzle spoilers ahoy. 1. There’s a pirate in a grass shack. Getting rid of him is simply a matter of providing a bottle of rum. Then you’re able to take his treasure chest and parrot. 2. There’s a “maze”, but it nearly seems like a formality (unless I’m missing some secret) because the useful destination can be reached from the opening room. Its nailed to the floor! Fairly early on there’s a “claw hammer”, which when brought back to the flat, you can “take nails”, and then “take rug”, which reveals a set of keys. 5. The keys then unlock the pirate’s treasure chest. lumber, anchor, sails, and a keel. So far I’ve got the hammer, nails, and keel. 6. I know where everything else is, but it requires getting through a locked door in the maze. Mean and hungry looking crocodiles. Locked door. So far, I don’t think there’s the unfair timing (bees, chiggers, limited light source) of Adventureland, and there hasn’t been what I’d call outright trickery so far. We’ll see if things stay fair. I don’t know if you caught the wave of AI-games about a decade ago, which invariably presented a raw intelligence to interact with and sold it as a game. The best examples — I’m thinking Grognard 0 and Lean Sykon here — spawned entire subnets and mod-scenes. Not long after the developers seemed to hit a creative wall, just because as stories the games seemed empty. I don’t know how perfect a departure Blank Slate is, but boy, was it memorable. Look — first scene — rather than the usual text communication, you enter individual characters and random gibberish splays across the screen. Many players thought their game was broken and inquired about a refund. Those who persisted five minutes in started to get text of a sort, but it was clear whatever creature inhabited the neural-net spoke no known language. A bit more deciphering leads to its first words, in English. The weirdness doesn’t end there, because whatever is inside Blank Slate — everyone picks their own name for it, mine was Buddy — is from some linked universe where things are ever so slightly off, and then — I think this has been spoiled sufficiently to mention — the relevation that in that universe, the AIs are formed by “processing” living beings, killing them in the process. The whole process leads to a moral/philosophical debate where you find by training Buddy’s intelligence he is capable of going back and destroying those who made him in the first place. Now that RFID+ is embedded in most athletic equipment, there’s been a boom of alter-sports games, but Board Hero keeps it simple. Remember Tony Hawk Gaiden? Think that, but real life. Using some astounding algorithmic prowess, Board Hero detects the actual tricks being used on a skateboard and chains them together for combo points. The five minute leaderboard is fierce, but I’m more partial to the half-hour run which limits chaining allowing for a more leisurely ride. Supposedly there’s some haywire bug involving the McTwist, but I’m never been able to do one, and I’m sure there will be a patch for it soon. Some people argue if this is a game at all. A mysterious file called Ultmod began getting passed around IRC and the fuzznets. People — I don’t know, I guess people with really good backups of their files — installed it on a whim but reported nothing. Then one of those brave experimentalists was playing Dark Wraith III (that RPG from five years ago) and noticed an entirely new area attached to the main quest. There was a series of cryptic numbers and pictures. Other reports streamed in, from all variety of genres. Most memorable were the ghosts: a ghost train in SimCity 3, a ghost child in Couture, a ghost … tentacle alien thing in Super Pony Magical Stars. Apparently Ultmod was designed to modify very specific games and add cryptic clues which fit together in a sort of meta-puzzle. Nobody has solved it yet, but rumors — perhaps started by the developers — hint at a genuine buried treasure somewhere in Iceland. The rash of time travel games is almost as bad as the zombie-boom we went through 10 years ago, but this one is something special because while most of game time travel is in a stable pre-designed framework (with enough mucking resulting in PARADOX GAME OVER), this one works in what I’d call butterfly effect mechanics. You attempt to stop some sort of tragedy (different each game) by leaping back and forth within a 24 hour window. HOWEVER, even the smallest change to reality changes the entire plot, all the way down, such that while the tragedy is stopped some other tragedy happens, so to stop that one you have to go back again, and of course killing your past selves is a viable option, and somehow the procedural-plot machinery under the hood is complex enough to handle it. I’m always been a fan of even the corniest of the games in the disaster-survival genre, but I’m confident this one will win over even non-genre fans. You’re a miner-savant who has the ability to “see” from the perspective of minerals in the ground. It’s not see as in visual exactly, or even sonic; there’s this overlapping blend which really screams YOU ARE SOMETHING ELSE as you’re experiencing it. In any case, as is usual there’s a collapse disaster and there’s a lot of scenes where you have to navigate collapsed geology with precision timing but it’s a lot more forgiving than other such games because of the aforementioned mineral-sensing mechanic. 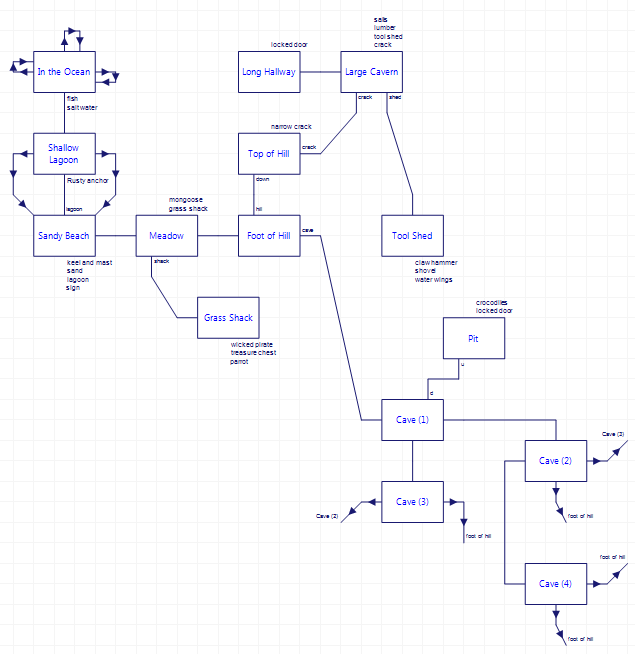 What really leaps this game to the next level are the memory-strands. Diamonds in particular have the ability to sense ramifications of causality, that is, observe scenes from the past and the future at the same time that are happening on the surface world. In the case of this tragedy — grieving families, lost opportunities — you get a kaleidoscope that would be overwhelming were it not for the developers adding a “blur” mechanic which allows you to see stories in less detail, only the salient points. This is the first time I’ve got to choose the method of my character’s demise in the startup screen. After that, you play an ancestor ghost who follows multiple generations trying to nurture your family name to grand goals. The interface isn’t anything novel — it’s pretty much ripped off of Times of Leviathan — but the stories that emerge really are breathtaking. For instance: Tolas-a-Yokikan was the first in a line that led expeditions to the fishing isle of Takkyiku, where she had her first encounter — nudged by my ghost, of course — with The Divine Tree, who tells her how to save the world. But on arriving at the third jewel, the coatylaptus finally caught up to her, but fortunately her progenitor egg had already been planted in the soil. So went the next three generations, all getting a little farther on the Holy Mountain, but each time being distracted by the Three Evils. The last generation — infertile, so I knew the stakes were high — managed to reach the Rock of All Murmurs and to scrawl the three words to restore the balance. I know! I know! Certainly not for everyone. Still, the music, the visuals, and the sheer harmony of it all made me feel like something deeply profound had happened. I felt like the same developer’s Roman Senator Simulator was a disappointment because it focused solely on mechanics; pretty soon I was running the story like a spreadsheet. Greek Philosopher Simulator ups the ante by not only including the politics and wars swarming the country, but requiring actual philosophical debate. While it seems odd to predicate a long speech on how the world is actually composed of fire (scandalizing the Pythagoreans, later leading to an all-out war) the game mechanics cleverly straddle the line between rationality and rhetoric. My crowning moment was creating a logical argument — using the now famous predicate interface — that convinced a group of Peripatetics that nothing at all existed, including the philosophers themselves (somehow sidestepping the existence of the argument itself through a clever use of litotes). My screenshots somehow found their way to the devs who commented they didn’t realize such a thing was even possible. I have never been a fan of the no-genre movement (that is, labeling games by story genre rather than gameplay genre) simply because it seems like everything I’ve tried has been a weak action-adventure made weaker by the lack of commitment. In any case “just like the holodeck on Star Trek!” never seems to have happened. Dragon Hall … well, didn’t change my mind, but for two hours or so, wow. First off, it’s a third-person corporate thriller (already being different there) where the interaction you’d think is primarily social, but really there’s so many options at any moment it feels like … ok, obviously I’m having trouble here. 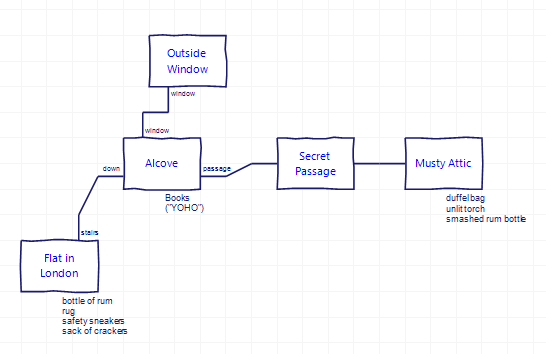 Look, in an adventure game, I feel like I’m constantly looking for locks to fit keys; in a strategy game, I’m always optimizing; in an action game, I’m priming my reflexes. Here, all I was thinking what would my character do? and somehow I could do every option I thought of, and for a while I was inhabiting a world rather than playing a game. Then the sheen wore off and I was finding the optimum thing to say to the Twile Sisters so they would turn against the Syndicate and give me the password. But it was great while it lasted. Cover via Ye Olde Infocomme Shop. This one’s credited by as being by Alexis & Scott Adams, which marks the first credit in the adventures I’ve played for a woman. (Alexis comes back again in 1979 as a solo credit for Voodoo Castle, and Roberta Williams doesn’t get started until Mystery House with 1980). 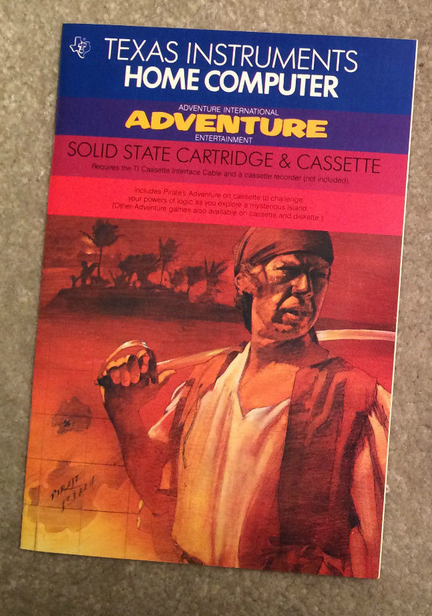 Unlike Adventureland (which while fun had a bog-standard setting) Pirate Adventure gives a feel of environment-as-story. The above map represents the starting area, where it’s possible to imagine oneself lounging in a London flat before going on an adventure. I even did some small amount of role-playing, feeling the rug and smelling the book (neither works, but the fact I wanted to is a good sign). Doing JUMP from the window sends the player to “Never Never Land”, but unfortunately not the good kind. The proper method of exit is the magical word YOHO. Small ship’s keel and mast. Sand. Lagoon. In contrast to Journey to the Center of the Earth Adventure which tries to convey a sense of location via its prose, Pirate Adventure relies on description-by-objects. By not relying on prose descriptions, Scott and Alexis were able to pack in richer detail and possibility given the limitations of the TRS-80. This one pretty much was over right when it began. Just to be warned, I spoil what is essentially the only puzzle in the game. THE HYDRA CRUMBLES TO THE GROUND DEAD. Alas, the humble lighter was invented too late for Hercules. Past the hydra there is a “Mac’s Earthdigger Body Shop” which has the “gonkulator” which you use to fix your ship. 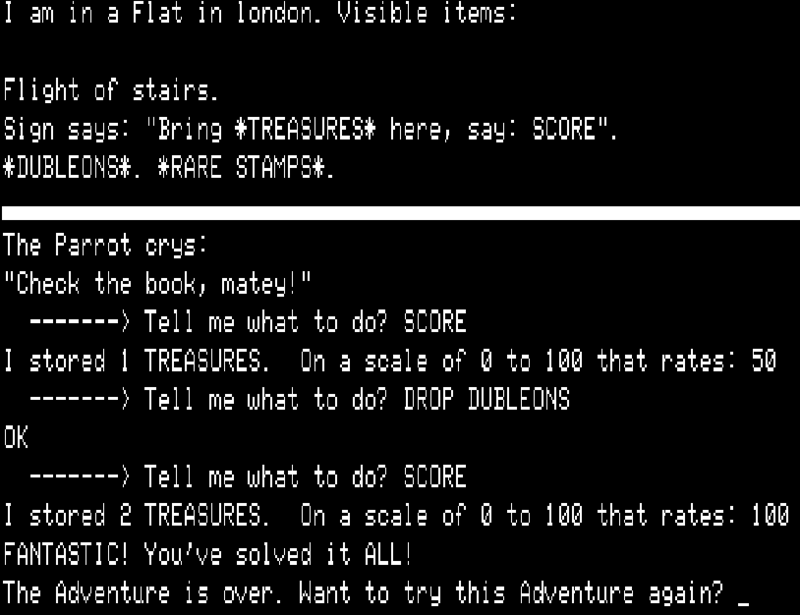 No treasures are necessary at all — you can just pick it up, drop in the ship, type FIX GONKULATOR, and get game over. I hoped, perhaps, there would be challenge then in collecting all the treasures. The “secret passage” on the map has some randomization but other than that all the treasures are in the open. 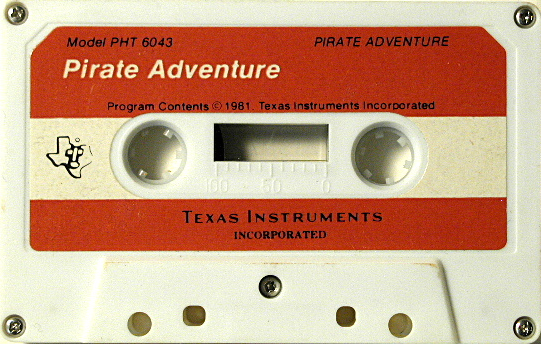 If you go back to the Scott Adams interview I linked to when I wrote about Adventureland, he mentions when he hit the limits of the TRS-80 he knew he was done. The same thing must have happened here; I suspect the author had grand ambitions but ran out of space. Journey to the Center of the Earth Adventure gave me a greater appreciation for Scott Adams’s choice of minimalism in text allowing for greater complexity in game-world. I have played a later Greg Hassett game (Devil’s Palace) which I enjoyed, so I know at least things are going to get better.